Employment Growth of Hospitality & Tourism Industry Cluster | Propel L.A. 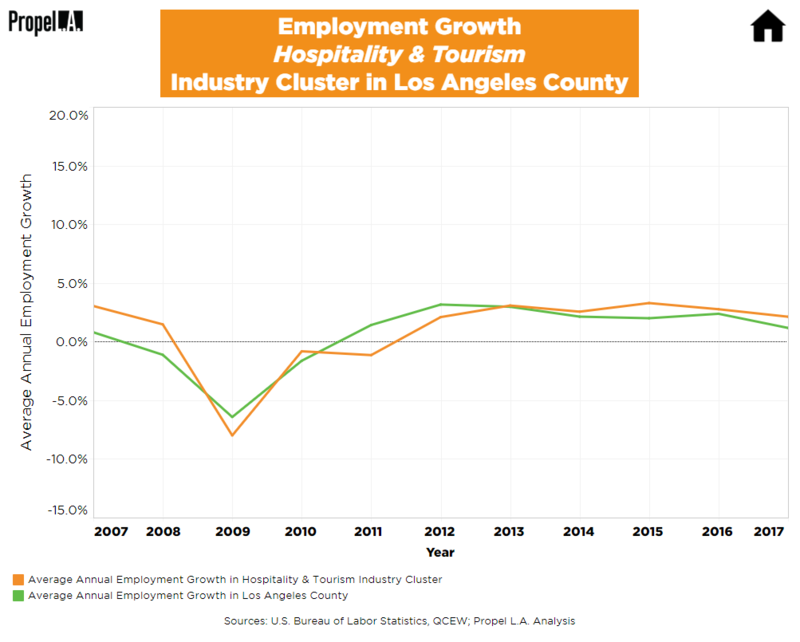 The Los Angeles County’s Hospitality and Tourism industry cluster (“Hospitality”) experienced a decline in employment growth from 2008 to 2011 but from 2012 onward maintained a steady 2.6% growth rate. This matches the average employment growth rate of Los Angeles County irrespective of industries or clusters, represented by the green line. Any rate below 0%, even if greater than the previous year, still indicates a decline in employment. Annual employment growth was calculated by dividing the change in number of employees between two consecutive years by the number of employees in the preceding year within all he selected NAICS industries. Calculations only account for private ownership. NAICS industries were selected by using the definition of the industry cluster produced by the Cluster Mapping Project (CMP) developed by the Harvard Business School. Due to large population size of NAICS industries in the Hospitality cluster, Propel L.A. selected a few through random sampling to represent this particular cluster. The summary of results may be slightly biased due to the NAICS industries being nonexhaustive. To learn what the Hospitality and Tourism industry cluster or an industry cluster is, read here.